In case we have not met, please allow me to introduce myself. My name is Andrew Kennedy and I am one of Britain's longest serving Conservative Party Agents, with seven General Elections and almost 30 years experience. Five years ago I helped form the West Kent Group, which is widely considered as the ideal model for the future of grassroots campaigning. Over recent years the Group has grown from three to six constituencies, with several more negotiating to join. 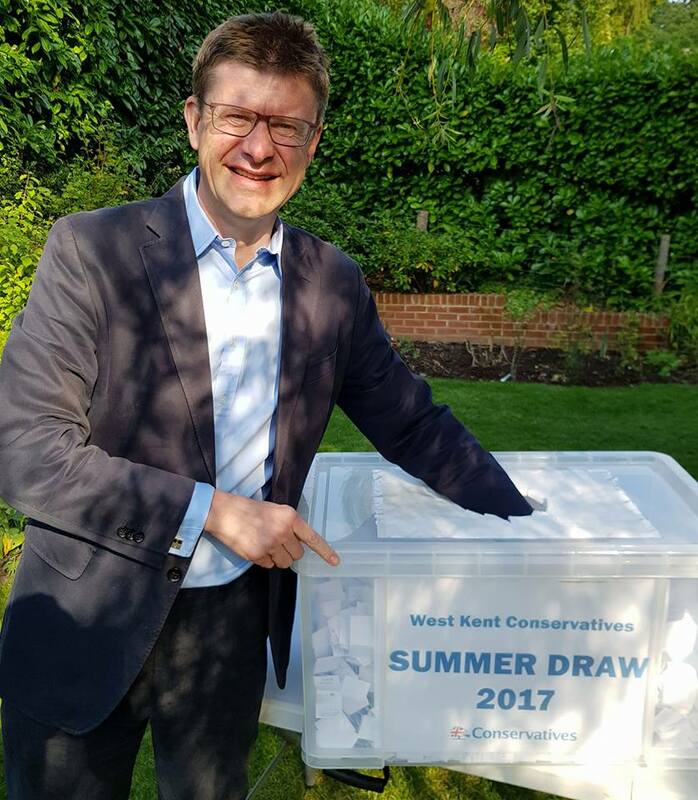 At the 2017 election I looked after seven Parliamentary Candidates including Greg Clark, Tracey Crouch, Adam Holloway, Helen Grant, Helen Whately, Tom Tugendhat and Craig Mackinlay. Building a pledge base so we have a wide and deep pool from which we can recruit new activists, donors and most importantly voters. Training and developing volunteers to improve both the quantity and quality of our campaigning, including accurate data and improved communications with residents on the issues that matter most. Maximising income from existing donors and developing new donor streams to ensure we have the money in place which we need to fight and win against an increasingly well-funded Labour Party. Finding new poster sites, postal voters, deliverers, canvassers and dealing with the dozens of vitally important tasks which are too often left until it is too late. Everything I do is based on thirty years practical experience at fighting and winning elections at all levels. 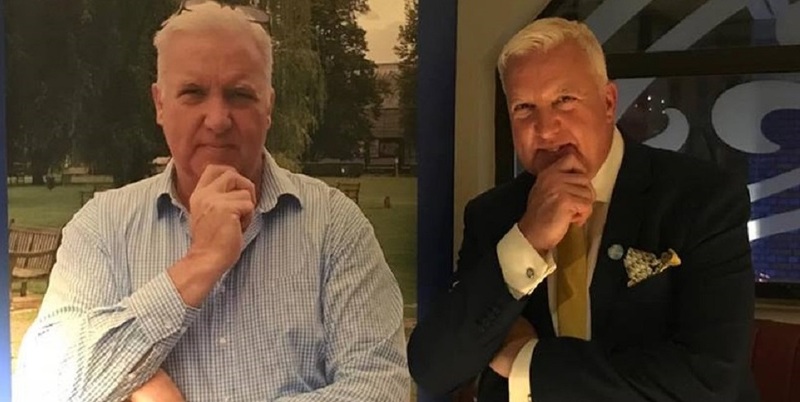 And if you are not familiar with my work and reputation, please take a look at some of the wonderful testimonials and endorsements from MPs and Council Leaders up and down the UK who I have worked with in recent years, (HERE). I will be at the Conservative Party Conference in Manchester from Saturday until Wednesday. If you would like to meet for an informal chat over coffee or a glass of wine to see how I might be able to help you, please get in touch. 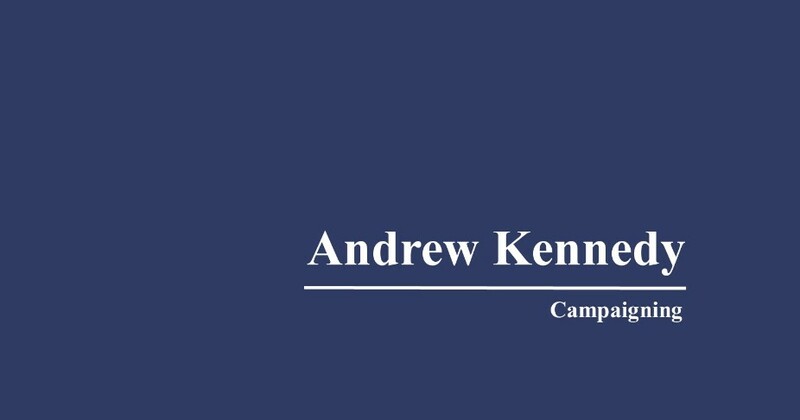 You can email me at andrew@andrewkennedycampaigning.co.uk or phone me on 07792 924820. PS You might be interested in attending the Conservative Home fringe meeting on Monday 2 October 2017 in "Central 5" with Rt Hon Robert Halfon MP and Rt Hon Nicky Morgan MP, when I will be speaking about the 2017 election, and what we must do better. Thank you very much for that warm and generous introduction. And thank you to Nabil Najjar, Luke Springthorpe, Mo Fisher and Ian Twinn and everyone at Conservative Progress and London Conservatives for organising today’s conference. It is refreshing to have this opportunity to look forward positively to what we must do better next time, so that we can avoid that awful, gut-wrenching feeling we all had when the results of the exit poll flashed up on the TV screens at 10pm on the night of the election. To plan for the future we must be honest with ourselves about what went wrong. Our failures must not be brushed under the carpet, nor should the process result in a culture of blame and recrimination. 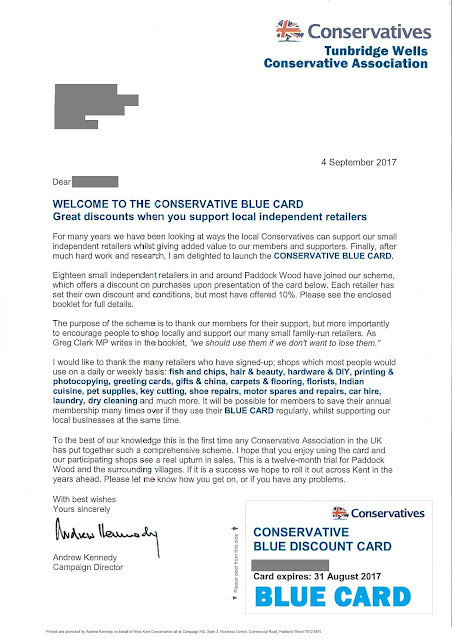 But the Conservative Party owes it to its members, donors and activists to involve them in that debate. And that includes to listening to opinions which may be unpalatable to those within the Matthew Parker Street bubble, opinions formed through tens of thousands of conversations on the doorsteps, and in the pubs, workplaces and dinner tables up and down the country. To seek to exclude our members and activists from that debate and to allow those who were responsible for the campaign to be both judge and jury, would be a dreadful disservice to all those who gave freely of their time, energy and money to help secure a Conservative Government. In 2015 I was invited by Andrew Feldman to contribute to the Voluntary Party Review. 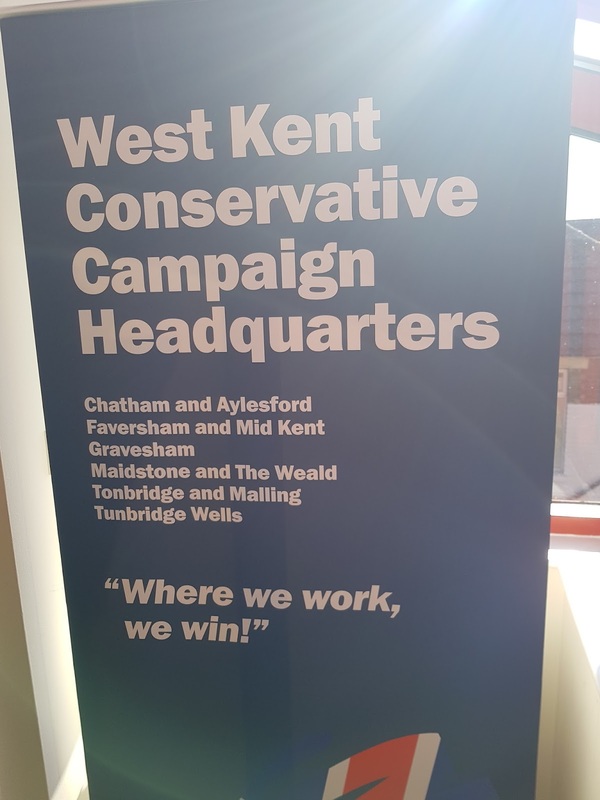 I gave detailed evidence and submitted papers on what we had achieved in West Kent, changes which resulted in one of the most successful “groupings” in the UK; a way of working which reduced costs and trebled the amount of money we had available to spend on campaigning. A model which maximised efficiencies whilst ensuring the autonomy of Associations and protected their long held and strongly defended right to select their own candidates. “We must ensure that any changes are bedded-in before our next major electoral challenge. Whatever we do, we should not allow a small number of recalcitrant Associations to use self-interest to block essential reforms which in our hearts we all know must come. The Party is in a unique position of strength. We have won an election that most people didn’t expect us to win. Our opponents are in disarray. We are ahead in the polls and our finances are strong. That was written in the summer of 2015. In the light of how little progress has been made and with the benefit of the 2017 campaign fresh in our minds, how prescient those words turned out to be. The first lesson we must address is the institutional dysfunctionality of much of the voluntary party. Please note the word “much” – because throughout the UK we are hugely fortunate to have the loyalty and support of thousands of people who constantly give more than their fair share, which is just as well as we have even greater numbers who have no intention of pulling their weight. In Kent as elsewhere we have members, many in their 80s and some in their 90s, many in poor health, who struggled from door to door delivering leaflets and canvassing for support. We had volunteers in the office six days per week, some for 8 hours a day, packing envelopes and manning the phones. And we even had members who took their entire annual leave to enable them to work full time, such was their determination to defeat the threat Jeremy Corbyn posed to our country. But sadly we also have more than our fair share of laptop warriors, who think elections are won on the comments pages of Con Home or Political Betting. Those with sharp elbows who always seen to be front and centre of the photograph for any visiting Minister, but cannot be seen for dust when there is work to be done, and too many who see the Party as a vehicle for self-advancement and self-aggrandisement, with no intention of contributing to a common goal or shared endeavour. 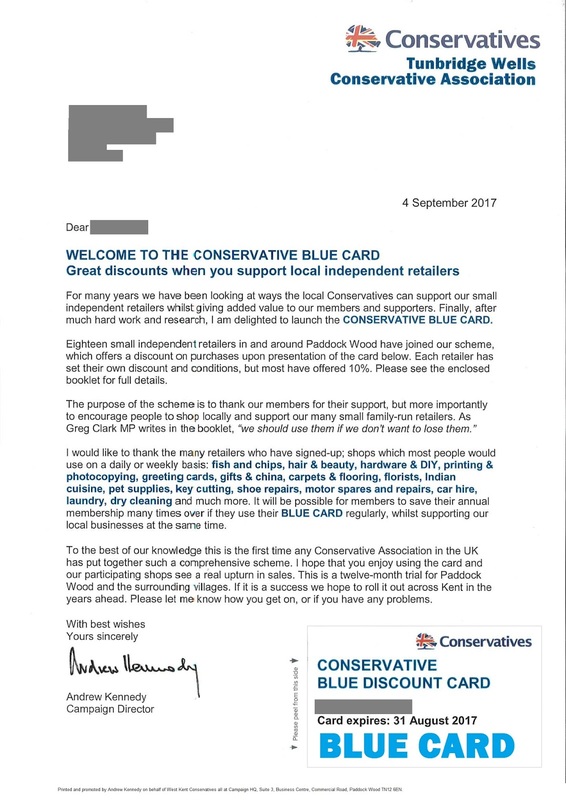 Locally we must accept that the Conservative Party is a national brand with branches throughout the country, just like Sainsbury’s, NatWest Bank or Hilton Hotels. …but we allow feuds – often decades old – to result in dysfunctional Associations failing to meet even the most basic requirements set out in the constitution. …yet we allow Chairmen and Management Committees to refuse to campaign or canvass or run GOTV as “they don’t believe in it”. yet we elect as our local leaders people who lose votes and membership due to their inability to use email and social media. I know of no other organisation which has such a laissez-faire approach to how its local branches work or are perceived; we have no Key Performance Indicators, impose no quality control, provide no training, turn a blind eye to continual non-performance and incompetence and fail to assess what, if anything, is being achieved. Is it any surprise our field operations are falling continually further behind? I acknowledge that the majority of activists are volunteers. But when a member seeks elected office, either as a councillor or a branch, association, county or regional officer, with that office comes duty and responsibility. Responsibility to those who elect them. Responsibility to the Conservative Party in whose interests they have been elected to serve. Those who seek office simply to advance their careers or promote their own agenda are seldom nett contributors to our success and would frankly not be missed. The present proposals to tackle our decline are Multi Constituency Associations (or MCAs). I fear these are not only too little, but also too late and destined to fail. My own experience of working with two federated groups of Associations bodes badly. Putting four weak Associations with one or two strong ones usually results in the weak Associations giving up, secure in the knowledge of their stronger neighbours will pay the bills and do the work. This results in further atrophy of the weak coupled with anger and resentment from those who are left to pick up the pieces. In politics as in life; you cannot make the weak strong by making the strong weak. In my area, the hardest and most demanding aspect of my job isn’t winning elections or raising the money; it is managing the often unreasonable and competing demands of six MPs, six Council Leaders, six Management Committees and 88 branch Chairmen, all of whom think their needs should take priority over everyone else’s. Putting a fresh faced, enthusiastic yet inexperienced CCHQ trained 25 year-old campaign manager in charge of an MCA is almost certainly not going to end well. It is unfair on the members and unfair on the Campaign Manager to expect them to manage such a viper’s nest of competing egos. What is clear is no change = no hope. We cannot carry on as before. We got away with it in 2015. We scraped by with the support of the DUP in 2017. We will almost certainly not be so lucky in 2022. Our failure cost us at least the 19 seats which we lost by a margin of below 1%; a stronger more focussed ground war would have delivered victory and provided Theresa May with a majority of 24. To illustrate the problem we face at grassroots level I would like us to examine the statistics from Kent. from 7,000 – 24,000 and we hold of 13 / 15 local councils. In terms of activism, political strength and organisation I suspect Kent is as good as it gets for the Conservative Party and probably better than most. It is also a county where one third of the constituencies fall under the West Kent Group and the other two thirds do their own thing, so we can easily compare and contrast. Across the UK our Associations spend around £3.2 million a year on campaigning. If that figure was increased to equal we spend in West Kent, we would nationwide be spending an additional £10million pounds each and every year on winning elections. Imagine the difference that would make. And if we are lucky, there will be a little bit left for a newsletter, though sadly in many areas there will be no-one available to deliver them and they will be hidden in the boot of our councillor’s car until they find their way to the recycling bin. There is a better way. My proposal is to take the best of what we do in West Kent but scale it up. My plan is for the Party to establish a network of 25 Campaign Centres, each covering around 20 constituencies, with separate arrangements for Scotland, Wales and Northern Ireland. We must not fall into the trap of working out what we can afford then squeezing the model to fit the money we have. We must work out what we need to win, then ensure the finance is in place to deliver victory. That means each Campaign Centre should cover sufficient constituencies to ensure it has the money and resource it needs to win rather than spending half its time and energy raising funds. This requires a base of 6,000 – 7,000 members. · A Campaign Manager to assist with campaigning plus one additional CM for each target seat within the group. · A part time graphic designer to ensure our literature was produced to the highest standard and also specialist help to ensure we have a strong and vibrant presence of social media. · All housed in a modern, accessible building with sufficient space to accommodate the staff comfortably and professionally. Obviously the costs would vary from region to region, but around £220,000pa should on average be sufficient to finance salaries and infrastructure. This, of course, would be shared between twenty Associations. 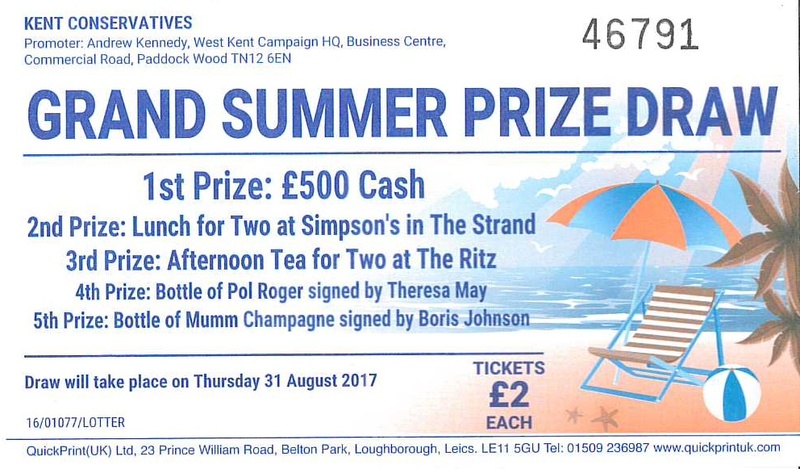 The cost could be covered by transferring membership income and the proceeds of the two annual draws from Associations to the Campaign Centre. Such a plan would negate the need for national membership and all the attendant risks involved whilst relieving Associations of the burden of collecting this money – something most don’t enjoy and few do well. My plan would also guarantee the independence of Associations to do the things which are most important to them. Each would retain their own Management Committee and Executive and the right to select their candidates run their internal affairs. The Associations only financial responsibility would be to raise money to fight elections, and they could do this from their patrons’ clubs, fighting fund appeals, social events and contributions from councillors and candidates. Their continued independence from CCHQ control would be guaranteed. But most importantly we would finally professionalise the party throughout the UK; ensuring campaigning was based on local issues and local need, enable the best quality literature to be produced with strong local content, that we were legally compliant and that resources were directed to where they are needed most, which is not where most of them actually live. These changes could be proposed by the Party Board, approved by the convention and ratified by a postal ballot of all members then implemented nationwide. If some of the crusty backwoodsmen get angry and resign in disgust, then we should say thank you and goodbye. The price of failure is too high to allow progress to be derailed by those who look back to halcyon days that never were. The opening paragraph of the Conservative Party Constitution is clear. There is no mention of our primary objectives to be to run garden parties, fall out with each other at Executive Council meetings and squabble over the ownership of the photocopier. Until we face up to this reality, the influence of the voluntary party will continue to decline along with our worth. Those of us who engaged with politics to win elections and bring about change must take control of the narrative and force change on voluntary party before it really is too late. 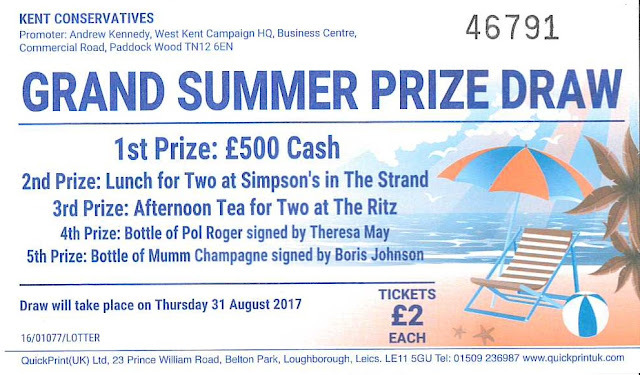 Amused to discover that the winner of a bottle of Mumms Champagne signed by Boris Johnson in the West Kent Summer Draw was....Jacob Rees-Mogg's Mother-in-Law ! We are delighted to welcome our friends and colleagues from Gravesham into the West Kent Conservative Group. Who will be Number 7?